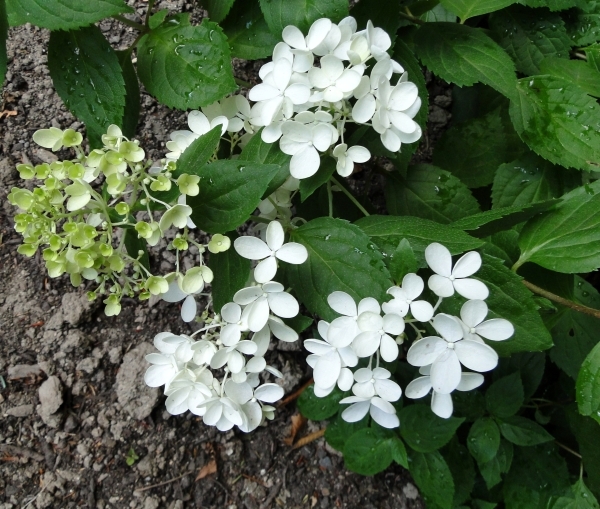 I’ve been waiting, with little hope, that my pee gee hydrangea (grandiflora) would begin to show some green. Of all the new hydrangea additions to my yard last Spring, it’s the only one that seems to have died. I managed to get a few photos of it’s pretty white flowers last summer, and I had hoped it would grow nicely in the new season, but it’s not to be. By now I would be seeing some signs of growth. My son stepped on it and I think that is what did it in, but maybe not. It may have already died over winter. The others – the Pinky Winky, Limelights and Endless summer are full of leaves so I know they have survived over winter. I found a Pee Gee tree when I was out at the nursery the other day and those become so pretty. I am jealous of people who have big yards with room to grow flowering trees. Recently the whole area where I live is alive with color. From fluffy white and pink specimens to the gorgeous Japanese magnolias (my favorites), I envy yards with those typed of ornamentals. I hope to get a photo of the flowering dogwood tree I saw last year just down the street. It was a beauty. Anyway, my attention is turned to the remaining hydrangeas in my yard. I look forward to the blue flowers especially. There are some beautiful hydrangeas in the stores around here. I can’t decide if I want to buy the pink or blue. I guess I should buy both. Depending on your soil, they could both end up the same color by next year.